Brown the mince in a large pan over a gentle heat, stirring so that the mince is evenly cooked. Add the onions and garlic and continue to cook, stirring, for 5 minutes until the onions are translucent. Stir in the remaining sauce ingredients and simmer for 20 minutes. Meanwhile, place the lasagne sheets in a dish and cover with boiling water so that they begin to soften. To make the cheese sauce, simply add all the ingredients except the cheese to a sauce pan. Cook over a medium heat, stirring continuously, until the sauce thickens. Remove from the heat and stir in most of the cheese, reserving a little for the topping. Preheat the oven to 200°C/ 400°F/gas 6. 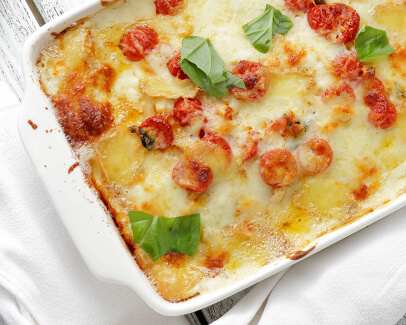 Assemble the lasagne in a dish a layer at a time. Start with a third of the meat sauce, followed by a third of the lasagne sheets followed by a third of the cheese sauce. Repeat this twice so that you finish with a layer of cheese sauce, then sprinkle with the remaining cheddar cheese.